Photo by Alex Wong/Getty ImagesSergey Kislyak pictured in Washington, DC in 2017. Bank examiners and federal law enforcement are investigating what they say is a suspiciously large check deposited in the account of Russia’s ambassador to the US in 2016, BuzzFeed News reported on Wednesday. The $US120,000 lump-sum payment from Russia’s embassy in the US in November 2016 to the ambassador, Sergey Kislyak, was more than twice as large as his previous annual salary payments, according to the report. Federal investigators have probed Kislyak’s contacts with at least three Trump campaign officials during the 2016 campaign and presidential transition. Examiners at Citibank and investigators from the FBI are probing what they say is a suspiciously large transaction in 2016 from Russia’s embassy in the US to Sergey Kislyak, Russia’s ambassador at the time, BuzzFeed News reported on Wednesday. 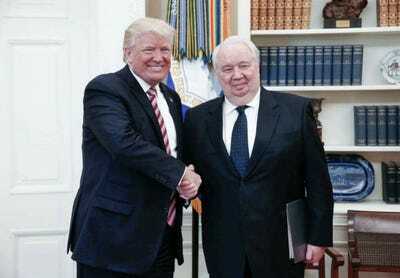 Citing new documents, BuzzFeed News reported that the investigators were examining a check from the Russian embassy marked “payroll” for $US120,000, believed to be Kislyak’s lump-sum 2016 salary, deposited in November 2016 shortly after Donald Trump won the presidential election. The $US120,000 payment was more than twice Kislyak’s annual salary in each of the previous two years, according to the report. BuzzFeed News reported that a branch manager at the embassy said the payment was a salary but that Citibank financial examiners were unable to independently verify that claim. Federal law-enforcement officials, including the special counsel Robert Mueller, have been investigating what they say are several suspicious financial transactions made by the Russian embassy,BuzzFeed News first reported in January. But the unusually large payment to Kislyak carries additional significance given his contacts with Trump campaign officials around that time, though there is no indication that it was related to those contacts. Jared Kushner, a senior White House adviser and Trump’s son-in-law, enlisted Kislyak in an effort to set up a back channel for secure communications between the Trump transition team and the Russian government using diplomatic resources in December 2016, though one does not appear to have materialised. Russian EmbassyPresident Donald Trump and Kislyak in the Oval Office on May 10, 2017. Michael Flynn, Trump’s former national security adviser, last year pleaded guilty to lying to investigators about multiple conversations he had with Kislyak in December 2016. As part of his plea deal, Flynn became a cooperating witness in Mueller’s investigation into Russia’s interference in the 2016 US election, whether the Trump campaign colluded with Moscow, and whether Trump obstructed justice over the course of the probe. Flynn and Kislyak spoke on the phone multiple times in the period between when the Obama administration announced sanctions on Russia over its election interference and when Russia decided against retaliatory measures – a decision Kislyak told Flynn was made at the Trump team’s request, prosecutors said in Flynn’s charging document. In March 2017, Attorney General Jeff Sessions recused himself from overseeing the Russia investigation after failing to disclose in his confirmation hearings a September 2016 meeting with Kislyak. Kislyak did not respond to BuzzFeed News’ request for comment, and the Russian embassy did not comment on the specific transaction, saying only that it did not violate any laws.